Posted on 14, November 2018 by EuropaWire PR Editors | This entry was posted in Education, Environment, Science, Switzerland, Technology and tagged Andreas Fischer, CH2018, Climate, climate change, climate_change, climate_mitigation, climatology, ETH Zurich, meteorology, MeteoSwiss, Switzerland becomes drier. Bookmark the permalink. ZURICH, 14-Nov-2018 — /EuropaWire/ — Switzerland is becoming drier, hotter and less snowy, and will struggle with heavier rainfall in the future – these are the conclusions reached by climate researchers from MeteoSwiss and ETH Zurich. Today, they presented the Climate Scenarios CH2018 produced on behalf of the Federal Council. These form the basis for the climate change adaptation strategy of the federal government. Vegetable farmers irrigate dry soils, tropical nights cause sleepless nights and homeowners struggle with flooding. According to the results of the climate scenarios, this is a foreseeable future in the event of unchecked climate change. It has already become warmer than previously in our country. “We have to prepare for the changing climate and adapt,” explains Andreas Fischer, project leader of “Climate Scenarios CH2018” at MeteoSwiss. Average rainfall will decrease in the summer in the long term, while evaporation will increase with rising temperatures. Soil will thus become drier. The average near-surface air temperature will rise in the summer months of June to August by 2.5°C to 4.5°C in comparison to today. At the same time, there is up to a quarter less rainfall, and the longest dry period without precipitation in summer lasts nearly three weeks. The increases in the highest temperatures are even more pronounced than for the average temperatures. On the hottest days in summer, it will be 2°C to 5.5°C warmer than now. Hot summers such as those of the record years 2003 and 2018 could thus become the norm. Heatwaves will become more frequent and more extreme. Metropolitan areas will be especially affected by heat stress. Individual heavy precipitation events will be more frequent and more intense in the future than today. The heaviest precipitation falling on a single day will increase by about 10% on average. Winters will be significantly warmer than current ones, with a possible temperature rise of 2°C to 3.5°C. Although there will be more precipitation, it will fall more frequently in the form of rain because of the higher temperatures. Snow will become less frequent and intense. The expected snow cover in low elevations will be halved compared to today. The zero-degree line will climb from today 850 m to 1500 m above sea level in winter. The snowy areas of Switzerland will therefore shrink considerably. The Climate Scenarios CH2018 are based on the latest climate models and enable the most accurate glimpse into Switzerland’s future climate. 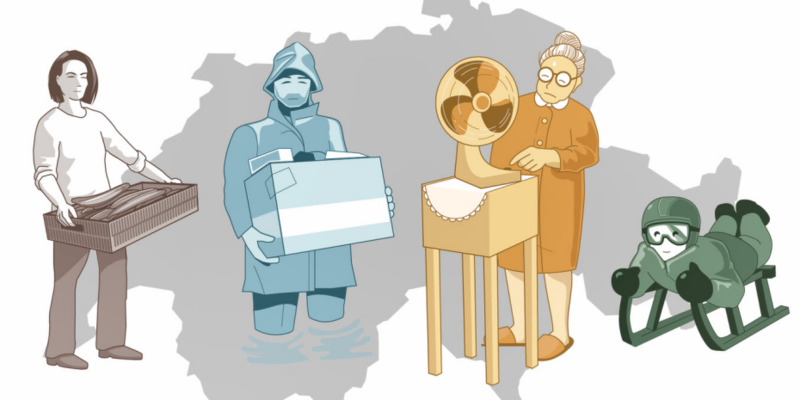 The researchers calculated the Swiss climate for the next 100 years. In addition to possible developments without additional climate change mitigation, they also considered an IPCC scenario with mitigation measures that would limit the global temperature increase to 2°C compared to pre-industrial levels. Climate mitigation does take hold: “With consistent climate mitigation, about half of the potential changes in Switzerland’s climate could be avoided by the middle of the 21st century, and about two thirds could be avoided by the end of the century,” says Reto Knutti, climate scientist at ETH Zurich. Despite all efforts, global warming can be curbed at best. Therefore, Switzerland (also) actively pursues an efficient adaptation policy. The Climate Scenarios CH2018 serve as a central climate service and form an important working basis for the government’s strategy “Adaptation to Climate Change”. The Federal Office of Meteorology and Climatology (MeteoSwiss) has been mandated by the Federal Council to generate climate scenarios on a regular basis. The Climate Scenarios CH2018 have been produced within this context. They provide decision-makers with planning criteria for mitigation and adaptation to climate change. The climate scenarios address the needs of users from administration, politics (and policy-making) as well as the private sector and have been tailored to practictioners’ require. The Climate Scenarios CH2018 were developed by the Federal Office of Meteorology and Climatology MeteoSwiss, ETH Zurich (Center for Climate Systems Modeling C2SM) and the University of Berne (Oeschger Centre for Climate Change Research OCCR) in collaboration with ProClim. They are published by the National Centre for Climate Services (NCCS). The climate scenarios and many other climate services are freely available on the new NCCS web platform.